The Personality of Godhead Ramacandra, being aggrieved for His distant intimate friend [Sita], glanced over the city of the enemy Ravana with red-hot eyes like those of Hara [who wanted to burn the kingdom of heaven]. The great ocean, trembling in fear, gave Him His way because its family members, the aquatics like the sharks, snakes, and crocodiles, were being burnt by the heat of the angry red-hot eyes of the Lord. The Personality of Godhead has every sentiment of a sentient being, like all other living beings, because He is the chief and original living entity, the supreme source of all other living beings. He is the nitya, or the chief eternal amongst all other eternals. He is the chief one, and all others are the dependent many. The many eternals are supported by the one eternal, and thus both the eternals are qualitatively one. Due to such oneness, both the eternals constitutionally have a complete range of sentiments, but the difference is that the sentiments of the chief eternal are different in quantity from the sentiments of the dependent eternals. When Ramacandra was angry and showed His red-hot eyes, the whole ocean became heated with that energy, so much so that the aquatics within the great ocean felt the heat, and the personified ocean trembled in fear and offered the Lord an easy path for reaching the enemy’s city. The impersonalists will see havoc in this red-hot sentiment of the Lord because they want to see negation in perfection. Because the Lord is absolute, the impersonalists imagine that in the Absolute the sentiment of anger, which resembles mundane sentiments, must be conspicuous by absence. Due to a poor fund of knowledge, they do not realize that the sentiment of the Absolute Person is transcendental to all mundane concepts of quality and quantity. Had Lord Ramacandra’s sentiment been of mundane origin, how could it disturb the whole ocean and its inhabitants? Can any mundane red-hot eye generate heat in the great ocean? These are factors to be distinguished in terms of the personal and impersonal conceptions of the Absolute Truth. As it is said in the beginning of the Srimad-Bhagavatam, the Absolute Truth is the source of everything, so the Absolute Person cannot be devoid of the sentiments that are reflected in the temporary mundane world. Rather, the different sentiments found in the Absolute, either in anger or in mercy, have the same qualitative influence, or, in other words, there is no mundane difference of value because these sentiments are all on the absolute plane. Such sentiments are definitely not absent in the Absolute, as the impersonalists think, making their mundane estimation of the transcendental world. “I am the source of all spiritual and material worlds. Everything emanates from Me. The wise who perfectly know this engage in My devotional service and worship Me with all their hearts.” (Gita 10.8) Further, He says, aham adir hi devanam: “I am the source of the devas.” (Gita 10.2) Srila Prabhupada explains that the three primal devas, or gods, are Brahma, Vishnu, and Mahesh and that Krishna is the origin of them all—even of Vishnu. Srimad-Bhagavatam describes the Absolute Truth in detail. It lists twenty-six incarnations of Godhead and states, ete camsa-kalah pumsah krsnas tu bhagavan svayam: “All of these incarnations are either plenary portions or portions of the plenary portions of the Lord, but Lord Sri Krsna is the original Supreme Personality of Godhead.” (SB 1.3.28) As such, Krishna includes all of the other incarnations, including the incarnation of Lord Ramachandra. Thus we need not worship Lord Ramachandra separately. By worshiping Krishna, we automatically worship Lord Rama simultaneously. Krishna, being the origin of everything and everyone, is also the origin of us, the living entities. So whatever qualities we have must also exist in Krishna—originally. We have individuality, so Krishna must too. We have form, and so must Krishna. We have thinking and feeling and willing, so Krishna must too. And we have activities, so Krishna must too. Krishna, the Absolute Truth, has everything that we have plus more—and in greater quantity. In the specific incarnation of Rama, the Lord acts as the ideal human being—the ideal son, ideal brother, ideal husband, ideal king. The Ramayana, the history of Lord Rama, is filled with the exemplary behavior of the Lord and His associates, and they all show ideal examples. Sita shows the ideal of a chaste wife, Laksmana and Bharata of faithful brothers. The Ramayana is full of ideal examples that we are meant to follow—ideal father, ideal son, ideal brother, ideal husband, ideal wife, ideal servant, ideal ruler, and so on. Lord Rama, who is ideal in every respect, still became angry—and aggrieved. Both are mentioned here. He became aggrieved because of separation from Sita, and He became angry at Ravana. Such sentiments as grief and anger exist in the Absolute Truth, in particular here in the person of the incarnation of Godhead, who shows the ideal in all respects. So we living entities also have such sentiments—even in perfection, after liberation. Of course, our experience in the material world is with conditioned souls, so what we have experienced of grief or anger is largely mundane. But we should not think that the Lord’s sentiments are mundane or that the Lord, being beyond material sentiment, is devoid of all sentiments. The impersonalists think, “We, conditioned souls, have anger and sorrow, so how can the Lord, who is liberated and pure, have anger or sorrow? In fact, He cannot have anything—no name, no form, no qualities, no activities, no relationships with others or sentiments and emotions—nothing.” They want to make everything zero. Thus statements such as “the red-hot burning eyes of Ramachandra” cause havoc for the impersonalists. As conditioned souls, we all tend toward impersonalism. Every conditioned soul has two conditioned tendencies: one toward sense gratification and the other toward impersonalism. So we carry impersonal conceptions with us even when we come to devotional service, and our impersonal conceptions may influence us to deal in impersonal ways even though we know in theory that we all are eternal persons and that Krishna is the supreme eternal person. Still, in practice we may tend to act in impersonal ways, because we may still have impersonal ideas that devotees should not feel sorrow or anger—or any “negative” emotion. And we may try to avoid responsibility for how our behavior affects other devotees by saying, “Prabhu, why are you getting upset? You shouldn’t get upset.” Although there may be truth to the notion that under certain circumstances a devotee should not become upset, we also should not act in such a way as to upset the prabhu. “Prabhu” means “master.” We are meant to see each other as masters and ourselves as servants. So we shouldn’t say, “Now, Prabhu, don’t get upset.” One wouldn’t tell one’s master not to get upset. Rather, we should say, “Oh, I am so sorry, my dear master. I am sorry that I made a mistake. I am sorry that I upset you. Please forgive me. Please rectify me.” That is the meaning of seeing others as prabhu. The same pastimes that are described here in brief, in three verses in the Second Canto, are elaborated upon in the Ninth Canto in two full chapters. The entire Ramayana is summarized in the tenth and eleventh chapters of the Ninth Canto of Srimad-Bhagavatam. And there Sukadeva Gosvami elaborates on these two points: the Lord’s being aggrieved in separation from Sita, and the Lord’s becoming angry. In relation to Rama’s separation from Sita, who had been kidnapped by the great demon Ravana, externally the Lord was lamenting. The Bhagavatam says that the Lord showed by His personal example the condition of a man who is attached to women—that is the material side of attachment. But the situation of Lord Rama is spiritual, beyond material conditions. The Lord and His pleasure potency—whether Sita-Rama or Radha-Krishna—are not of the material world. They are completely spiritual, and their activities are within the internal energy. The separation of the Lord from His consort is an activity of the Lord’s pleasure potency (hladini-sakti) and serves to increase their transcendental bliss. So although externally the Lord appears to lament in separation from His devotee or His devotees appear to lament in separation from Him, internally they experience transcendental bliss and actually relish the feelings of separation (vipralambha) as the highest ecstasy. Once, when Rama was wandering through the forest searching for Sita and lamenting, Parvati, Lord Shiva’s consort, saw Him but did not recognize Him. She thought that He was an ordinary man in grief. She told her husband and guru, Lord Shiva, what she had seen, and he replied, “That was no ordinary man. That was the Personality of Godhead Ramachandra.” But Shiva could detect that she had some doubt in her mind, so he warned her, “Do not try to test Him. He is the Personality of Godhead, Lord Rama.” Still, she wasn’t convinced. She harbored some doubt within her heart. So, Parvati disguised herself as Sita and went out to trick this man. She appeared before Lord Rama looking exactly like Sita. In effect, she was saying, “Here I am, Your beloved Sita.” But Lord Rama did not even see her; He ignored her, as if she didn’t exist, and continued searching for Sita. But from her side, wherever Parvati looked, she saw Rama, because He had expanded Himself into so many forms that wherever she looked she saw the Personality of Godhead Ramachandra. Parvati realized that her husband was right. She had made a mistake, but she didn’t want to admit it. So she left the area, reassumed her original features, and returned to her husband—and didn’t say anything about what had happened. But Lord Shiva knew, so he asked, “Did you see anything unusual in the forest?” She replied, “No, not in particular.” So he became angry—not just because she had disobeyed him, but because she had not told him the truth. And he was ready to burn her to ashes. Returning to the pastimes of Lord Ramachandra as described in Srimad-Bhagavatam: After searching for Sita in the forest and being unable to find her, He ultimately learned that she had been kidnapped by Ravana and carried to his capital of Lanka. So Lord Rama made His way to the southern tip of India, to the Indian Ocean, and there glanced over the golden city of Lanka, angry that Ravana had kidnapped Sita and thus insulted the Raghu dynasty. The ocean, in a sense, created an impediment to Rama and His army reaching Lanka, but the anger in His eyes created so much heat that the aquatics in the ocean were burning and the ocean was trembling. So, the ocean personified came before the Lord and offered to give Him way—to not impede His travel. Commenting on this incident as described in the Ninth Canto of Srimad-Bhagavatam, Srila Prabhupada raises the question of why suffering is necessary. In the Bhagavad-gita Krishna says, sarva-dharman parityajya mam ekam saranam vraja/ aham tvam sarva-papebhyo moksayisyami ma sucah: one who surrenders to Me is relieved of all sinful reactions. So from where does the surrendered devotee’s suffering come? Just by chanting the holy name of the Lord once, like Ajamila, in namabhasa, without offense, one is freed from the reactions to more sins than one is able to commit. From where, then, does the suffering of a devotee come? When Ravana was engaged in the battle, the trunk of the elephant which carried the king of heaven, Indra, broke in pieces, having collided with the chest of Ravana, and the scattered broken parts illuminated all directions. Ravana therefore felt proud of his prowess and began to loiter in the midst of the fighting soldiers, thinking himself the conqueror of all directions. But his laughter, overtaken by joy, along with his very air of life, suddenly ceased with the tingling sound of the bow of Ramacandra, the Personality of Godhead. The culmination of Ravana’s kidnapping Sita and taking her to Lanka was that Ramachandra killed him and freed Sita. And for us, there is a great lesson to be learned. Sita is the Lord’s energy, the Lord’s property, and if we try to take the Lord’s energy, His property, for our own purposes, for our own enjoyment, we will lose everything and we will be destroyed. In other words, the mentality of enjoying the Lord’s energy or using the Lord’s property for one’s own purposes is demonic. And if we persist, we may be destroyed like Ravana and his dynasty, and our property may be devastated and lost. Even as devotees, we may have some vestiges of this demonic mentality—the desire to take the Lord’s place and enjoy His property—and so we pray to Lord Rama and to Laksmana, who have so kindly appeared in Kali-yuga as Gaura-Nitai, to destroy our sinful mentality. After defeating Ravana and his armies, Lord Rama found Sita, who had been kept captive in a forest of asoka trees. She had become thin, being aggrieved because of separation from Him. And naturally, she was delighted to see her eternal Lord and master. But according to strict Vedic custom, a lady who spends the night outside of her home is considered to be tainted. In the orthodox Hindu system, the girls do not spend the night out of their homes. They stay first under the care of their fathers; after marriage, under the care of their husbands; and after their husbands pass away, under the care of their grown sons. So, Lord Rama refused to accept Sita. Naturally, she was heartbroken, but He refused to accept her, because she had spent the night outside and thus her position was unknown. Finally, it was concluded that Sita’s chastity would be tested. She would be placed in a fire. If she survived the fire, it meant she was pure. And if she was burned in the fire, it meant that she had not remained chaste. So, Sita was placed in the fire, and she emerged unscathed. But there are some secret facts, which we can learn by the mercy of Sri Chaitanya Mahaprabhu. Once, when Lord Chaitanya was traveling in South India, near Madurai, He was invited for lunch by a learned brahman who was a rama-bhakta, a devotee of Rama. After taking His bath in the river, Lord Chaitanya went to the brahman’s house to have lunch, but the food was not ready, because the brahman had not cooked. Finally, late in the afternoon, Lord Chaitanya took His lunch, but the brahman fasted. Lord Chaitanya continued His travels in South India, and at a temple in Ramesvara He heard a reading from the Kurma Purana about Sita’s chastity. That scripture says that when Ravana came to kidnap her, she took shelter of Agni, the fire-god, who covered her original form and provided an illusory representation of her, which Ravana took. So the original Sita was never abducted by Ravana—only the maya-sita. And when Rama killed Ravana and Sita was released and brought before the fire, Agni made the illusory form disappear and delivered the real form of Sita to Lord Ramachandra. Thus the original Sitadevi was reunited with her eternal Lord and master, Ramachandra. “The devotees of the Lord are released from all kinds of sins because they eat food which is offered first for sacrifice. Others, who prepare food for personal sense enjoyment, verily eat only sin.” When one eats even vegetarian food prepared for one’s own bodily nourishment, one is eating lumps of sin. And when one eats the same ingredients prepared and offered in love to Krishna—krsna-prasada—one becomes purified and liberated from all sins. The same item can act either materially or spiritually depending on how it is used, in what consciousness. So we should be careful to use whatever facility we receive by the grace of the Lord exclusively for the Lord’s service and not for sense gratification. Once, a gentleman who had recently wedded came before Srila Gaurakisora dasa Babaji Maharaja. When Babaji Maharaja heard about the man’s marriage, he remarked, “It is good that Sambu Babu has married. Now every day he should personally cook for Krishna, offer the food, and serve the prasada to his wife. If he thinks of her more or less as his worshipable guru—not someone to be enjoyed or exploited by him—he will benefit. Everything that exists is Krishna’s property, meant for Krishna’s enjoyment, and should be used for Krishna’s service. Sambu should not think of his wife as his servant. Rather, he should respect her as Krishna’s servant.” So, whatever it may be, we should see the person or the object as Krishna’s property, meant to be engaged in Krishna’s service. Then we can move in the world without becoming entangled. But as soon as we think, “Oh, here is something nice for me to enjoy,” we may be entangled. That demonic mentality of wanting to enjoy apart from the Lord may become prominent, and then we may require some special mercy to free ourselves from that contamination. Krishna may take from us the object of our material attachment and remove that obstacle to our spiritual progress (yasyaham anugrhnami harisye tad-dhanam sanaih). We have many lessons to learn from the pastimes of Lord Ramachandra, but in relation to today’s verse in particular, Srila Prabhupada is pointing out the most fundamental of all lessons: that the Personality of Godhead is a person with all of the sentiments of a person and that we too are persons, eternally. Even in the liberated stage we have such sentiments, and we should respect them. We do not necessarily reject “negative” emotions that arise within us as being material, because they may in fact be spiritual. Even a “negative” emotion engaged in Krishna’s service is spiritual, and a so-called noble sentiment outside of Krishna consciousness is material. “In the material world, conceptions of good and bad are all mental speculations. Therefore, saying ‘This is good’ and ‘This is bad’ is all a mistake.” (Cc Antya 4.176) In other words, nothing is really good or bad. If it is favorable to Krishna’s service, it is real—and good. Otherwise, it is illusory. Unlike Mayavadis, we do not reject sentiments—“Oh, you should not get angry.” In fact, Mayavadis themselves sometimes get angry, but they try to conceal it—“Oh, we can’t get angry.” Actually, sometimes it is our duty to get angry. Once, a young American who happened to attend the first Delhi pandal became so inspired by Srila Prabhupada and the devotees that he came to meet Prabhupada after the program. 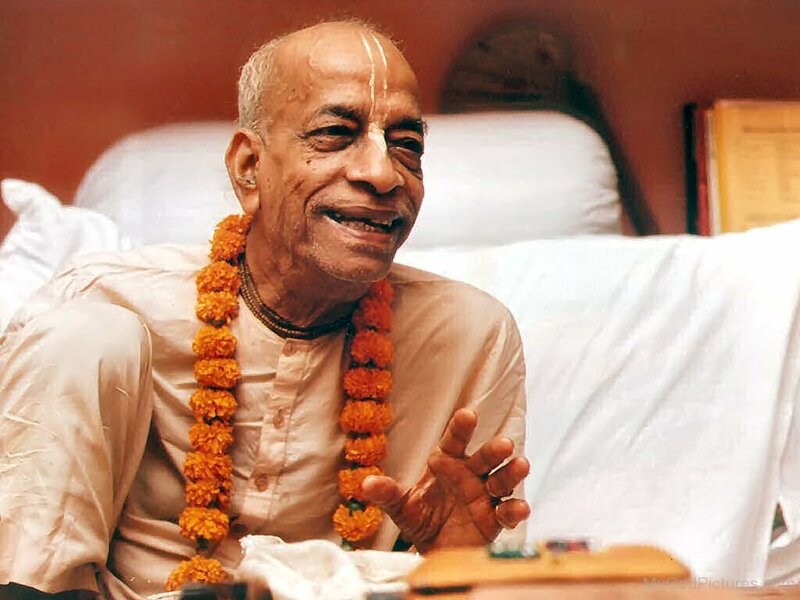 In a heartfelt display of eloquence, he expressed his appreciation to Srila Prabhupada: “If the world could just become Krishna conscious, there could be peace and happiness. People would learn to love each other and give up their hatred and anger.” Srila Prabhupada replied, “Anger? Is there something wrong with anger? Did someone tell you that anger is wrong?” The young man didn’t know what to say. Then Srila Prabhupada explained, “Krishna spoke the whole Bhagavad-gita just to make Arjuna angry. He wanted to convince Arjuna to fight and kill the enemy, and how can you fight and kill unless you are angry? He spoke the whole Bhagavad-gita just to make Arjuna angry.” So, anger, when used in the service of the Lord, is spiritual. After Ravana kidnapped Sita, Rama sent Hanuman to Lanka to find her. Eventually Hanuman did, in the asoka grove, but he was soon apprehended by Ravana’s soldiers. To punish and humiliate him, they set fire to his tail. But Hanuman was no ordinary monkey. He was a great devotee, powerful as a demigod, and he went on a rampage through the whole of Lanka, setting it ablaze. That’s how furious he was. And so we see that anger can also be used in the service of the Lord, as demonstrated by Hanuman and Arjuna. Because spiritual sentiments and activities can resemble mundane ones, we can easily misunderstand the Lord or His pure devotees. We may think that such transcendental sentiments are mundane, or that the Lord and His pure devotees have no such sentiments. Thus one may develop an artificial view of the Lord and His devotees. From our experience with Srila Prabhupada, we know that, like the Lord, a pure devotee has the full range of emotions—but all in relation to Krishna. And a pure devotee may temporarily become angry or distressed, according to the situation. Sometimes Prabhupada became discouraged—or encouraged—by what others said and did. He was fixed in his relationship with Krishna and in his service to Sri Chaitanya Mahaprabhu and his guru maharaja—they were the center of his life—but with temporary changes of circumstances related to Krishna’s service, he could display temporary changes of emotion. As soon as we finally got the Juhu land in ISKCON’s name, Srila Prabhupada wanted to start raising funds to build the temple for Krishna, Sri Sri Radha-Rasabihari. He said to his friend Dr. C. P. Patel, “Now we want to begin the collection for the construction.” And Dr. Patel replied, “People won’t give.” Srila Prabhupada countered, “Bombay is such a rich city that if the people of Bombay wanted, they could give the entire amount in one day.” And Dr. Patel replied, “They don’t want. You have to bring the money from America.” Prabhupada responded, “I could bring the money from America, but then what is your credit?” Dr. Patel began, “Prabhupada, I don’t want to discourage you . . .” And Srila Prabhupada interjected, “But you are discouraging me.” So, Prabhupada could become discouraged. Similarly, he could become encouraged. Once, Srila Prabhupada called me into his room to discuss book distribution in India, and at the end he said, “Seeing you all so enthusiastic to distribute books, I become enthusiastic.” Being a relatively new devotee, I thought, “Srila Prabhupada is always in transcendental bliss. How can our enthusiasm increase his enthusiasm?” In time, I began to overcome my impersonal conceptions and to realize that, like Krishna, liberated souls are always persons, with the full range of emotions, and can be encouraged or discouraged. So, when we deal with devotees, we should always be careful—and considerate. Sri Chaitanya Mahaprabhu was considerate. Every year, Sivananda Sena would lead the devotees from Bengal to Jagannatha Puri for Ratha-yatra, and it was a major effort. The party, which numbered two or three hundred, went by foot, and he arranged prasada and accommodations for them and sometimes boats to take them across rivers. One day when the party was being checked by a toll collector, the other devotees went ahead while Sivananda Sena remained behind to pay the taxes. Because no one else could arrange for their accommodations, the devotees waited beneath a tree. Meanwhile, Nityananda Prabhu, who was with the party that year, became very hungry and upset. And when Sivananda finally arrived, Nityananda stood up and kicked him severely. Of course, Sivananda accepted the kicking as the greatest blessing. After bringing Nityananda Prabhu to His residence, he told Him, “The dust of Your lotus feet is not attainable even by Lord Brahma, yet Your lotus feet have touched my wretched body. Today my birth, my family, and my activities have all become successful.” But Sivananda’s nephew, who was only a boy, felt offended and left the group. On his own, he traveled to Jagannatha Puri to meet Chaitanya Mahaprabhu. When the boy reached Mahaprabhu’s residence, Lord Chaitanya’s servant told him to remove his coat and shirt, because the rule is that when one comes before the Deity one must remove such garments. But Chaitanya Mahaprabhu said, “Don’t disturb him. He has come in a distressed state of mind. Let him do as he pleases.” Lord Chaitanya considered the person’s emotional state, the person’s psychology. And when someone is in a distressed state, you don’t disturb him. Rather, you try to help him, to pacify him, and then talk of other things. Once, Srila Prabhupada told Tejiyas Prabhu, then the temple president in Delhi, that the problem with his disciples was that they didn’t understand common psychology. We may want to give someone some instruction, but we may have to wait until they are ready to hear. We may have to pacify them first, and then they may be more open to what we have to say. We may have to wait for the right time. It is the speaker’s responsibility to present his message in such a way that his audience will appreciate and accept it. If our audience becomes discouraged—or inimical—we should feel responsible. We should think how we can improve and perhaps act to rectify the situation—by the grace of the Lord and the devotees. Narottamananda dasa: Thank you for the wonderful class, Maharaja. I read the Valmiki Ramayana produced by Bhakti Vikasa Maharaja. In that account, after Rama returns to His capital, Ayodhya, with Sita, He hears the slanderous (that is the word the book uses) statements of some of the residents, such as “How has Rama accepted Sita back when she sat on the lap of a raksasa? How has Rama accepted Sita back after she lived in the house of that villain for over a year?” And Rama, the representative of the Iksvaku dynasty, became disturbed and asked His brother Laksmana to leave her in the forest near Valmiki Rsi’s ashram. Actually, Sita herself had a desire to visit the sages along the bank of the river, so on the plea of satisfying that request, Laksmana took her there, explained the situation to her, and left her there, near Valmiki’s ashram. Earlier, Rama had inquired in His court, “What are the citizens saying about us? Without knowing what they are saying, we can never improve ourselves.” Rama had made that point. He insisted, and finally His ministers came out with these criticisms from the residents of Ayodhya. Then an incredible pastime took place, when Valmiki brought Sita back to Ayodhya to establish her purity before the citizens. 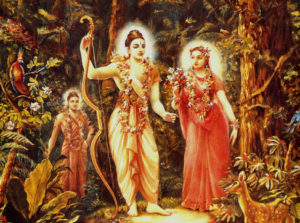 He proclaimed, “I have performed austerities for sixty thousand years, and I state that if this woman is in any way unchaste, let all the results of my austerities be taken from me.” Then Rama asked Sita to show her purity. And she declared, “If the residents of Ayodhya don’t accept me, then at least, if I have been chaste to You, let my mother, Bhumidevi, the earth-goddess, take me back.” Then a huge earthquake took place and a crevice opened and from within the earth Goddess Bhumi came out on a golden throne surrounded by celestial snakes (nagas). She announced to all that Sita was chaste and that she would accept her. Tearfully, she embraced Sita and took Sita with her; they vanished into the earth, and the earth closed. And Rama fell off His throne, crying and lamenting in separation from Sita. Thereafter, Rama made a golden deity of Sita, which He kept by His side. And so it was established that Sita was perfect in every respect. There are different perspectives. When one accepts a position of leadership, he or she does so with the intention to help the people, even those who are ignorant and offensive. And so the leader may adjust his or her behavior. Sita was pure and Rama was pure, but when He found that some of the residents were finding fault with Him, He sent her away. He didn’t want people to criticize Him—not because He minded the criticism personally, but because to rule effectively and guide the population, He had to have their complete support and faith. Still, where this incident is described in the Ninth Canto, Srila Prabhupada refers to those critics as rascals. He says that Lord Ramachandra, fearing such rascals, abandoned His wife, Sitadevi. We find that Sri Chaitanya Mahaprabhu also adjusted His behavior when He was criticized. When a senior sannyasi criticized Him for eating too much, He reduced His eating by half. All the devotees became upset; as it was, the Lord accepted so many austerities. But because the sannyasi was a godbrother of His spiritual master, Sri Chaitanya Mahaprabhu respected him as a superior and said of him, “He is concerned about My sannyasa principles. He doesn’t want Me to overeat.” But the devotees were distressed and could hardly wait for the sannyasi to leave town. And when finally he did leave, they felt as if a great burden had fallen from their heads. Then Chaitanya Mahaprabhu accepted prasada as usual. Sometimes someone in a high position will make an adjustment for a rascal—but not always. It depends on the issue and the context. Even in relation to that offensive sannyasi, Ramachandra Puri, it was said of Chaitanya Mahaprabhu, kabhu ramacandra-purira haya bhrtya-praya/ kabhu tare nahi mane, dekhe trna-praya: “Sometimes He accepted Ramacandra Puri as His master and considered Himself a servant, and sometimes, not caring for him, He would see him as being just like a straw.” (Cc Antya 8.94) Sometimes Srila Prabhupada didn’t compromise, and sometimes Lord Chaitanya didn’t either—but sometimes they did. In India, Srila Prabhupada would be open to visitors every afternoon for one or two hours. Anyone could come and see him. 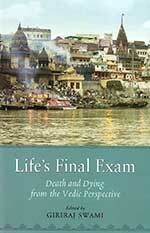 But in his later years, Prabhupada’s health wasn’t that good, and he often complained that he wanted to translate more. In Juhu once, he even cited the example of Aurobindo, who would give darshan just once a year, from his balcony. And Prabhupada said that he wished he could do that. “Otherwise,” he said, “people just come and waste my time. They ask, ‘Swamiji, how is your health?’ Everyone can see that my health is not good.” So he proposed that he should do as Aurobindo did, give audience only once a year. And the devotees, of course, were ready to facilitate whatever Prabhupada wanted. But finally Prabhupada concluded, “No, because if I don’t meet people, they will think, ‘Oh, Swamiji is a big man now. He has no time for us. He has become puffed up.’ Maybe when the new complex is ready, I can do that—not now.” So, he continued, until the very end—until his illness prevented him—to have open darshan every afternoon. In practical matters he could compromise—he could make adjustments for the sake of the fallen souls—but on certain matters of principle, certain matters of philosophy, there was no compromise. When it came to his main mission, he often quoted, “The dogs may bark, but the caravan will pass.” “We don’t care,” he said, “We will go on. Let the dogs bark.” But to please someone—to avoid offending someone—he could adjust. For example, after the first Delhi pandal, one of the main organizers invited Srila Prabhupada to her home for a program. She had done a lot of service and really wanted to help. She invited many prominent people to the program, and after the kirtan in her garden, Prabhupada and the devotees went in the house to take prasada. Now, one of the preparations had onions in it. And Malati dasi, wanting to save Srila Prabhupada, warned him, “Prabhupada, this preparation has onions in it. We can’t take this.” But Prabhupada didn’t want to offend the host, so he ate it. Malati said, “Prabhupada, there are onions in this.” And Prabhupada replied, “No, there are no onions in this.” There were, but he didn’t want to discourage his host. He didn’t want to hurt her feelings. So, in some ways we may compromise, to encourage and elevate people, but in other ways we don’t compromise. And we have to be intelligent enough to be able to distinguish between principles that we must maintain and less important details that we can adjust. Giriraj Swami: We can always see a higher arrangement, but we cannot assume that they were impelled by yogamaya to find fault. For example, in special cases some demons in the Lord’s pastimes were actually the Lord’s eternal associates, but in other cases they were just demons. Rupa Gosvami explains that Sisupala and Dantavraka in one appearance were Jaya and Vijaya, eternal associates of the Lord, but in other appearances of the Lord they were just demons. We can’t say that all the residents of Ayodhya were necessarily eternal associates who were being guided by yogamaya, but we can certainly say that they were fortunate, because, as citizens of Ayodhya, they got to see the Lord. And in the end they all were liberated by the Lord’s grace. So, we can also see a higher arrangement. Narottamananda dasa: After Sita exhibited that pastime of entering into the earth, the demigods from heaven showered flowers from above and praised her, and all the people present, even those whose minds had been confused and who had been blasphemous, began to praise Sita and Rama again and again. It was glorious. But Rama Himself, seeing this and being separated from Sita, was devastated. “After completing the sacrifice, Lord Ramacandra, whose lotus feet were sometimes pierced by thorns when He lived in Dandakaranya, placed those lotus feet in the hearts of those who always think of Him. Then He entered His own abode, the Vaikuntha planet beyond the brahmajyoti.